Here’s a shirt dedicated to the heroes that we looked up to, the heroes that we loved, the heroes that we were. Every once in a while you gotta look back and admire yourself for saving the world so many times in so many different ways. Also so many different worlds, I guess. First save Earth, then save Hyrule, then save Mushroom Kingdom. 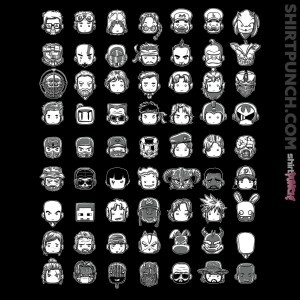 You could be forgiven for not being able to recognize every single one of the faces on this shirt, but you better know at least three quarters of them. Wrap this piece of cloth around your torso and proclaim to the world that these are your heroes and you love them.